Anyway, somewhere in the middle of last week, after an absolutely disastrous day in the kitchen (more about that later), I pulled out a recipe for what could be best described as the most comforting food of all time – Cinnamon rolled buns (you may have seen them on Instagram) ! This was my first time using dry yeast and though I wont say it’s the easiest recipe in the world, I will say this: There is something immensely satisfying about perfectly risen dough and the plethora of possibilities that it brings. 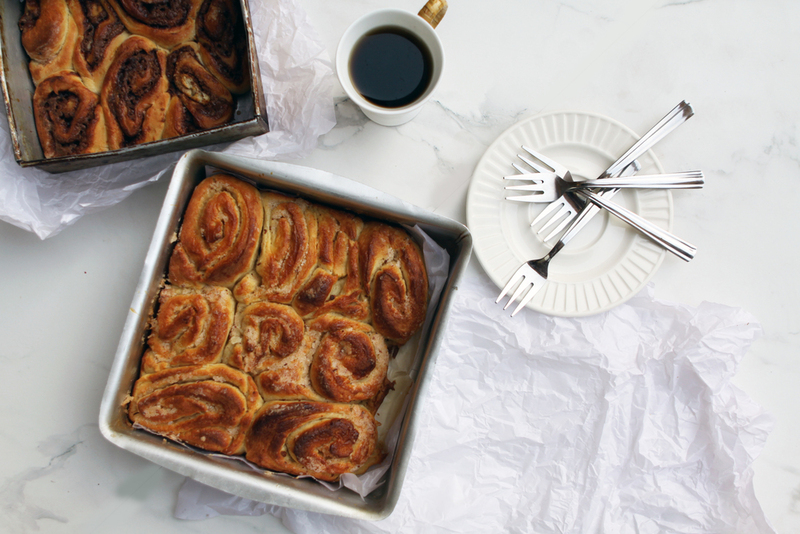 Since it’s just dough, you can use it for anything from cinnamon buns to bread to buns stuffed with minced meat. So feel free to experiment. I used Nigella Lawson’s recipe from How To Be A Domestic Goddess – This is a book that a couple of my friends gave me for my birthday one year and that’s when I started baking, and I swear by it. (Its in shreds now). And, 1 egg beaten for glazing. 2) Put flour, sugar, salt and yeast together in a large mixing bowl. 3) In a separate bowl, whisk together milk, eggs, and melted butter. 4) Mix the milk/egg/butter mixture into the flour mixture. 6) Form dough into a ball and place in an oiled bowl, cover with cling film and leave for 30 minutes to rise. 7) Take one third of the dough and stretch or roll it out to cover a baking tray which has been lined with baking paper. 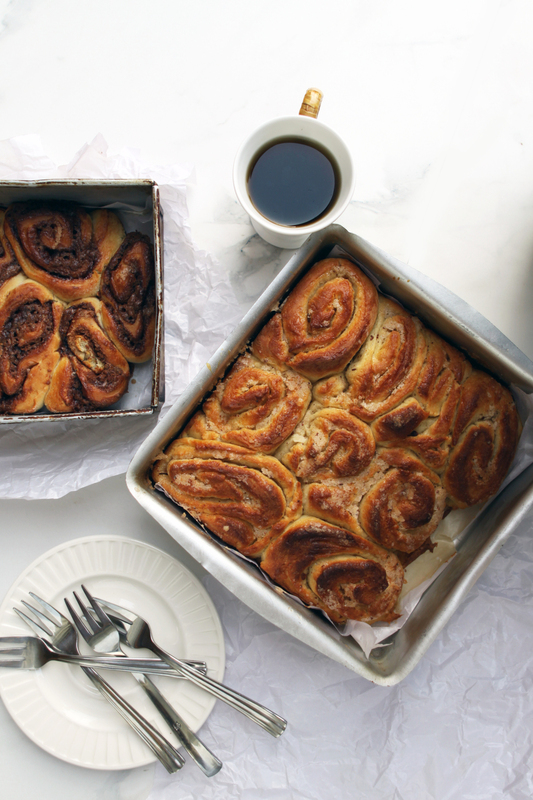 9) Cover with the cinnamon butter – be generous here because you really want the cinnamon butter to be the star. 10) Roll it up into a sausage and slice into 2cm slices, placing each slice on the dough base on your baking tray. 11) Glaze with egg using a pastry brush. 12) Leave for 15 minutes to rise. 13) Put in the over for 20 – 25 mins. 14) Put on a cooling rack, and then eat warm. Also, here are six things you should know if you’re making these for the first timelike I was. Firstly, it could (it probably will) get really messy – but it’ll be worth it. Secondly, these are pull apart rolls so they will be stuck to each other when done and that’s fine. Fourth – the dough is just dough – you can even stuff it with Nutella if you like (I did a little experimental batch). Fifth – Eating this warm & fresh is the only way this should be eaten. If you’re eating it the next day, heat it a little first. Finally, I promise this is completely worth every minute of your time. Happy fall and happy baking !